We still don’t know the real reason for blocking FaceTime in the Middle East but we do know that FaceTime works in Tunisia. Vodafone Qatar announced that they will reactivate it and Government policies in Qatar prevented initial FaceTime availability. Vodafone Egypt confirmed that saying that Egypt’s NTRA decided to block FaceTime. So no conspiracy theories there. And this fix should work with other carriers that are having problems activating FaceTime on iPhone 4 for one reason or another. This solution is presented by iPhoneislam and is called FaceTime Hacktivator. It relies on Jailbreak so we have to remind you that any iOS update will cancel jailbreak and FaceTime. We take no responsibility for jailbreaking your iPhone. Here are the steps for installing FaceTime Hackticator quoted as I already have FaceTime and do not need to Jailbreak my iPhone 4. Wait 1 to 10 minutes and FaceTime should be activated. If it took more than 15 minutes try resetting network settings. Please share your results in the comments. Of course this is a temporary solution that could be disabled later on so carriers need to fix this issue from the start. So far only Vodafone Qatar appeared to be doing something regarding the issue. Thanks for the heads up @houssini @paracha3 @shady_jd15. I can’t edit my sim phone number.. it just says unknown and I cannot click on it. Did you try to go to Settings>Phone and My number, then you can edit there your number by adding the country code, example +971… then click on Save. Stuck on waiting for activation…can anyone confirm if this works…! Did anyone actually did video chat using FaceTime after applying thus patch? works!!! got the facetime option in call menu and so on!!! I officially confirm that iphoneislam FaceTime solution works on Mobily iPhone. Just did a video chat over FaceTime with friend in US. How much time did it take for you to activate it as I am on Zain Network….my number is entered correctly with correct format…..and I even reset my Network Settings and its still Stuck on activation! Hi MJ.. what carrier you are using Du or Etisalat? and where did you buy your iPhone? This fix was NOT made by iPhoneislam…. It was made by “Darkvoid” from Emiratesmac forum. He published it on 27th oct, after that came iPhoneislam on 28th and claimed that they have better fix than his. Mr. Khalid A… Can u comment on this pls. thanks you so mch darkvoid… my facetime now is working….. great!!!!! great!!!! it’s working!!!! I bought my iphone 4 in mobily… thank u so mch!!!! iphoneislam… just follw the instruction…..
yeah me too .. Mobily Prepaid, it used like 10 SR worth of credit sending the SMS but nothing is happening ..
Not working with STC SIM … Anyone can help ??? 1) Make sure your phone number is correctly formatted in Settings > Phone. It will look like +9665xxxxxxxx. 2) Make sure that you are WiFi and turn FaceTime on in Settings > Phone. Wait for at least 5-10 minutes. 3) If it takes credit away but it does not active FaceTime, reset Network Settings under Settings > General > Reset and try again. 4) If that doesn’t work either reset All Settings under Settings > General > Reset and try again. hi can you please tell me how did you got it worked ( how you could click on my number button)? Facetime works on my iPhone 4 iOS 4.1 after jailbreak and install in cydia this iphoneislam hacktivator. Mine is bought in mobily khobar and im using stc microsim. Try it. Thanks to the guys who made this wonderful apps. I was using a Zain Micro Sim and it said it will charge me for activation and I allowed it. Since two days it was stuck at “waiting for activation” and my dissapointment can be seen in my above comments! 1) I deleted the FaceTime Hacktivator. 2) Reboot my iPhone 4. 3) After opening went into Settings and Reset ALL Settings. 5) I went into Settings, Phone, and Set MY number as +9665xxxxxxxx and clicked Save. 7) It automatically rebooted and when I opened the Phone, FaceTime was ALREADY ACTIVATED!! Without using any credit! 8) I went into my contacts and made a FaceTime call and it was brilliant. 9) Then powered off and put my old Zain Micro Sim back. 10) Again it gives me the message stuck on waiting for activation and doesn’t change! 11) Sadly I believe Zain is strongly unsupported somehow. Follow all steps in order above and I’m definite you will not be stuck. For Egypt: I feel you should try using the Exact same Micro-Sim that they provided you with your iPhone 4. Let me know if it works and what you guys think why it doesn’t work with Zain! I tried all the steps mentioned on my du iPhone 4 with a microsim, but it still doesn’t work. Do you have another solution for UAE users? Will you please send me the link to “How to jailbreak iOS 4.3 iPhone 4” on Windows…. The micro sim is the one i got wid my fone. I just have one question does the fone have to be factory unlocked? If your iPhone is not factory unlocked, then you can’t use any Saudi Network’s Sim in it. SO to activate FaceTime you will need an Unlocked and Jailbroken iPhone. YAAAY thanks 4 the update! I live in syria i have iphone 4 and i bought it from CANADA its not working, i use MTN and i get stuck in WAITING FOR ACTIVATION what to do guys? My MTN is 8.0 but im gonna check my fido later cuz i have to go to school now 🙂 i hope it works u’ll be the best man! He means anything that is 8.0+ probably. 3) Go to Settings and Reset ALL Settings. 5)go to settings-phone and retype ur number in my case its +20 xxxxxxxxx and click Save. P.S. my iPhone’s model is MC605C so its not the one that people have that they bought from Saudi arabia or UAE etc. How long should I leave it saying “Waiting for activation”?? Robben,,,man I’m telling you that all the apps you mentioned above are ONLY for people whose FaceTime was blocked by Apple ‘Officially’ and this happened ONLY in the Middle East…you’re issue is standard activation one which yea will be solved when you go to Canada…. Just a heads-up…whenever I take my Mobily sim out and put it back in…the FaceTime option is Off and upon turning it ON again it takes 2 seconds and activates…what I mean to say is ask Fido people in Canada that when you restart your iPhone in a foreign country will the FaceTime have to be re-activated!? But zain micro kept giving me “waiting for activation” :s what to do?? asap!!! Dude i think Zain does not support FaceTime activation as I too waited for 2 days on it and no luck…i then put in Mobily micro sim and it activated in two minutes!! As far as I read Zain doesnt wont support facetime……. Available New 4G Apple iPhone 32Gb (FACTORY UNLOCKED) with 1 year Apple International warranty. Shipping Information: FeD Ex & UPS Express Delivery within thirty six hours (36Hrs) directly to door step destination. @ Naomi Cleff, if you are going to advertise, please tell the PRICE ?? there is FaceTime Hacktivator app avilable, but no option to install or confirm, so waiting to upgrade new repo compatible with ios 4.2.1. Cheers guys! thanks for the info it helped but i have a problem i cant press on the my number button in settings phone to change it its stuck on unknown anyone knows why? does it have to do with its jail broken ? Hi there, just wandered by. I have a Fort Worth 4g site. Amazing the amount of information on the web. Wasn’t what I was looking for, but nice site. Have a good day. Anybody has the update for face time in Saudi Arabia. I recently bought an iPhone and want to use the facetime feature but I cannot activate it. I’ve been those steps, install apps but to no avail. I’m using Mobily by the way. 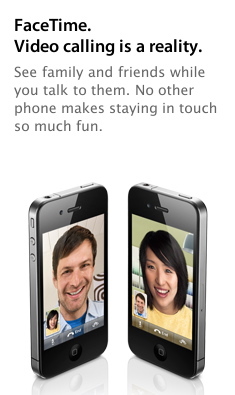 I just activated the Face time feature in my iPhone tonight (07 Oct. 2011). iOS 4.3.3 K.S.A. Mobily network. I installed the FaceTime Hacktivator and Middle What app before and when I try to activate the FT it wont, just stuck on ‘waiting for activation’ but tonight it only took around 5 seconds. Heya, many thanks due to this publish. my significant other so i observed that by means of probability, but it really surely finished up staying precisely exactly what my spouse and i needed. i most certainly will go back after so that you can learn even more. Cheers.